We had seen how Rsi Abraham’s sacrifice of his son Isaac was a sign pointing to the sacrifice of Jesus. After Abraham died, his descendants through this son Isaac, now called Israelites, had become a vast number of people but also had become slaves in Egypt. So we now come to a very dramatic struggle that is centered through a man called Moses and which is recorded in the Hebrew Veda of Exodus in the Bible. It is so named because it is the account of how Moses led the Israelites out of slavery in Egypt 500 years years after Abraham, about 1500 BC. Moses had been commanded by The Creator God (Prajapati) to confront the Pharaoh (ruler) of Egypt and it resulted in a contest of wills between Moses and Pharaoh. This contest has also produced nine plagues or disasters against Egypt. But Pharaoh had not agreed to let the Israelites go free so God was going to bring about a 10th and final plague. You can read the full account of the 10th Plague in Exodus through the link here since it will help you in following the explanation below. This 10th plague decreed by God was that an Angel (Spirit) of Death would pass through every house in Egypt. Every firstborn son in the entire land would die on that specific night except those that remained in houses where a lamb had been sacrificed and its blood painted on the doorposts of that house. The destruction to Pharaoh, if he did not obey and paint lamb’s blood on his door, would be that his son and heir to the throne would die. And every house in Egypt would lose the firstborn son – if they did not sacrifice a lamb and paint its blood on the doorposts. So Egypt faced a national disaster. But in houses where a lamb had been sacrificed and its blood painted on the doorposts the promise was that everyone would be safe. The Angel of Death would pass over that house. So this day was called Passover (since death passed over all houses where lamb’s blood had been painted on the doors). Now those who have heard this story assume that the blood on the doors was a sign for the Angel of Death. But notice the curious detail taken from the account written 3500 years ago. The Israelites were commanded to celebrate Passover on the same day every year. The Jewish calendar, being a lunar calendar, is a little different from the Western calendar, so the day in the year changes each year if you track it by the Western calendar. But to this day, still 3500 years later, Jewish people continue to celebrate Passover as a festival on the same date every year in memory of this event in obedience to that command given then. Here we see how the Passover drama is a Sign to us. Jesus, the ‘Lamb of God’, was crucified (i.e. 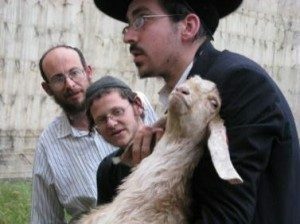 sacrificed) on the very same day of the year that all the Jews were sacrificing a lamb in memory of the first Passover that had occurred 1500 years before. 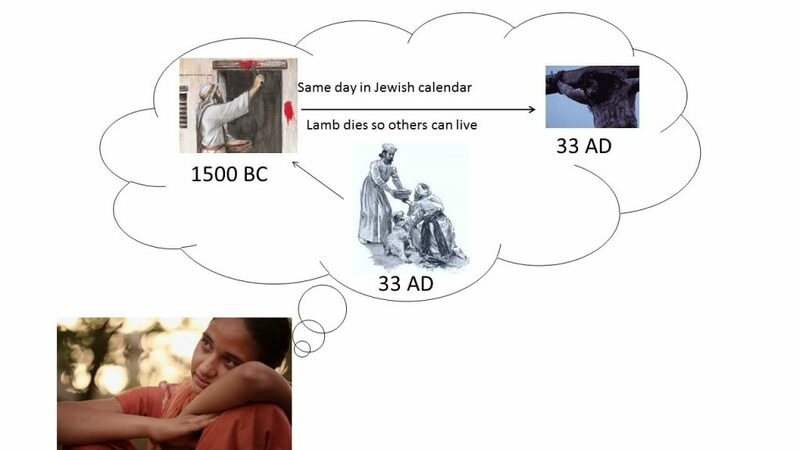 This explains the annual timing of two holidays that re-occurs every year – a parallel that so few of us notice and even fewer ask ‘Why?’ The Jewish Passover Festival occurs almost every year at the same time as the Christian Easter festival does – check a calendar. (Every 19th year there is a divergence of a month due to the cycle of lunar-based leap years in the Jewish calendar). This is why Easter moves every year because it is based on Passover, and Passover is timed by the Jewish calendar which calculates the year differently than the Western Calendar. Now think for a minute about what ‘signs’ do. You can see some signs below here. The flag is a sign or symbol of India. We do not ‘see’ just a rectangle with an orange and a green band across it. No, we think of India when we see the flag. The sign of the ‘Golden Arches’ makes us think about McDonalds. The sign of the ‘√’ on tennis player Nadal’s headband is the sign for Nike. 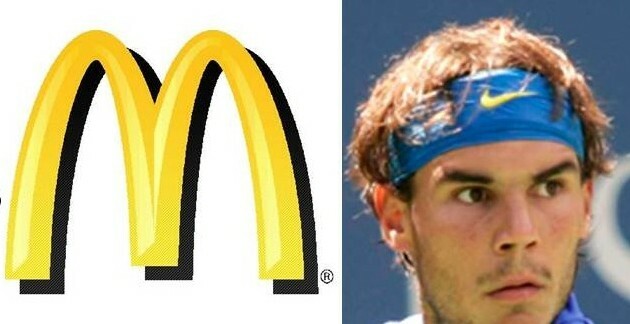 Nike wants us to think of them when we see this sign on Nadal. In other words, Signs are pointers in our minds to direct our thinking to the desired object. The Passover account in the Hebrew Veda of Exodus explicitly said that the Sign was for the people, not for Creator God (though He would still look for the blood and pass over the house if he saw it). As with any sign, what did He want our minds to think of when we look to Passover? With the remarkable timing of lambs being sacrificed on the same day as Jesus, it must be a pointer to the sacrifice of Jesus. It works in our minds like I have shown in the diagram below. The sign was there to point us to the sacrifice of Jesus. In that first Passover the lambs were sacrificed and the blood spread so the people could live. And thus, this Sign pointing to Jesus is to tell us that he, ‘The Lamb of God’, was also given as a sacrifice to death and his blood spilt so we could receive life. very same place where Jesus was sacrificed. That was a Sign to make us ‘see’ the meaning of his death by pointing to the place. In the Passover we find another pointer to Jesus’ sacrifice – by pointing to the same day in the year. A lamb sacrifice is once again used – showing that it is not just a coincidence of any event – to point to the sacrifice of Jesus. In two different ways (through location and through timing) two of the most important festivals in the sacred Hebrew Vedas directly point to the sacrifice of Jesus. I cannot think of any other person in history whose death is so foreshadowed by such parallels in such dramatic fashion. Can you? These signs are given so that we can have confidence that the sacrifice of Jesus really was planned and ordained by God. This was to give an illustration that helps us visualize how the sacrifice of Jesus saves us from death and cleanses us from sin – the gift from God to all who will receive it. This entry was posted in Journey through the Veda Pusthakan (Bible) and tagged meaning of passover, Moses and karma, moses and passover, Passover and karma on 03/06/2014 by [email protected].